The national mood in Egypt has turned significantly more negative over the past year. Dissatisfaction with the country’s direction is up, and optimism about the future is down. A plurality still believes the country is better off than when Hosni Mubarak was in power, but three-in-ten say things are worse. About three-in-four say the economy is in bad shape, and most think the country’s standard of living is declining. Many also believe law and order and morality are deteriorating. Egyptians are almost evenly split over the country’s recently approved constitution. 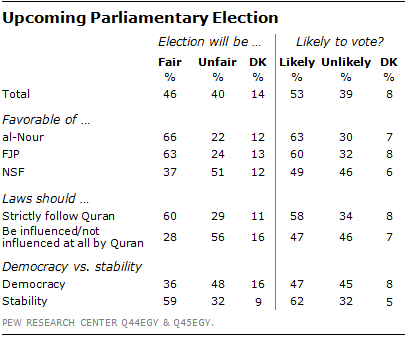 Looking forward, fewer than half think the upcoming parliamentary elections will be fair. Only 53% say they will vote. On many of these issues, there are sharp divisions in Egyptian society. Those who express a positive view of the Muslim Brotherhood-affiliated Freedom and Justice Party (FJP) and the Salafist al-Nour Party tend to have somewhat more positive views about the state of the country, as do Egyptians who want the Quran to shape the country’s legal system and those who prioritize stability over democracy. People who back the opposition National Salvation Front (NSF), those who want the Quran to have less legal influence, and people who prioritize democracy offer more negative evaluations. Only 30% of Egyptians say they are satisfied with the way things are going in their country, down from 53% last year and 65% in a spring 2011 poll conducted weeks after the ouster of Mubarak. Today’s level of satisfaction is comparable to the level observed in spring 2010, roughly a year before the revolution. About four-in-ten Egyptians (39%) say that Egypt is better off now that Mubarak is not in power, 30% think the country is worse off and 26% volunteer that things are neither better nor worse. Views about the country’s current direction and assessments of the post-Mubarak era divide sharply along partisan and ideological lines. Among people who express a favorable opinion of the FJP, 53% are satisfied with the country’s direction. A similar percentage (51%) holds this view among those who have a positive opinion of al-Nour. However, roughly three-in-four supporters of the NSF (74%) think Egypt is on the wrong track. Only 23% describe the current economic situation in Egypt as good, while 76% say it is bad. Looking at this question over time, national economic ratings declined steeply from 2007 to 2010, and then rebounded somewhat in 2011 after the toppling of Mubarak. However, views have turned more negative over the past two years and are now very similar to the 2010 low point. Optimism about the economy has decreased even more sharply. In last year’s poll, half of Egyptians thought the national economy would improve over the next 12 months. Now, just 29% are optimistic; roughly four-in-ten (42%) think things will get worse. People are no more positive about their personal economic circumstances. About one-in-five Egyptians (21%) describe their personal economic situation as good, while 79% say it is bad. This is essentially unchanged from last year, when 23% said their personal economic situation was good and 76% said it was bad. Personal economic ratings are closely linked to education – 65% of college-educated Egyptians describe their situation as good, compared with just 13% of those with a secondary education and 8% of those with primary education or less. Few believe their personal finances will improve in the next 12 months – only 21% hold this view. Roughly half (48%) think their circumstances will worsen, and 28% believe they will stay the same. Over the long term, there is also more pessimism than optimism. A 42% plurality predict that when children in Egypt grow up, they will be financially worse off than their parents. Just 22% think they will be better off, while 29% volunteer that children will be at about the same financial level as their parents. On key issues facing the nation, Egyptians see few signs of progress. About one-third believe that, compared with the past, the fairness of the judicial system and personal freedoms are getting better, while about the same number think they are getting worse. Views about the state of personal liberty vary along religious and political lines. Among those who believe Egypt’s laws should strictly follow the Quran, 42% say personal freedoms are improving and just 27% say they are getting worse. In contrast, among those who say laws should only be influenced by the Quran or that it should have no influence, 21% say things are getting better and 47% say personal freedoms are deteriorating. About half of those with a favorable view of the FJP (52%) and al-Nour (51%) say personal freedoms are improving. But a 42% plurality of people who express a positive view of the NSF believe they are getting worse. Overall, Egyptians are more likely to believe law and order is getting worse (44%) than to think it is getting better (26%). 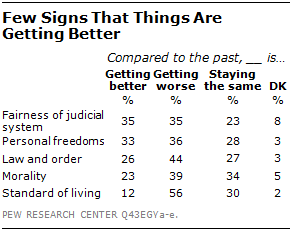 Similarly, 39% think morality is declining, while only 23% think it is improving. Opinions about the country’s standard of living are especially negative – 56% say the standard of living is getting worse; only 12% say it is getting better. Egyptians are almost evenly divided over the country’s new constitution, which was approved in a controversial December 2012 referendum: 49% favor it, and 45% oppose it. Views on this issue are strongly correlated with ratings for major political organizations, views about the Quran and law, and the trade-off between democracy and stability. About two-thirds of those with a favorable opinion of al-Nour and the FJP favor the constitution, compared with just 37% of people with a positive view of the NSF. The constitution is twice as popular among those who believe laws should strictly follow the Quran (62% favor) as it is among those who do not think laws must strictly follow the Quran (31%). Egyptians who prioritize stability largely endorse the new constitution, while those who prioritize democracy tend to oppose it. Less than half of those surveyed (46%) believe upcoming parliamentary elections will be fair.1 Four-in-ten think they will not be fair, and 14% offer no opinion. A 45% plurality believe the next parliamentary elections will improve conditions in the country, while 28% think they will make things worse and 22% say they will have no effect. Meanwhile, about half of Egyptians (53%) say they are likely to vote in the upcoming elections. Views about the elections break down along ideological and partisan lines. Al-Nour and FJP supporters, those who think laws should strictly follow the Quran, and those who prioritize stability are especially likely to believe the elections will be fair and to say they will show up at the polls.